The manliest sport of them all: Petanque. 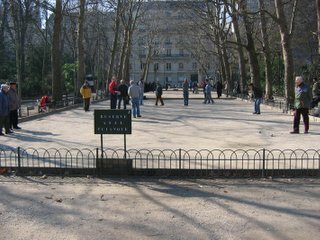 Like Bocci Ball, Petanque is a game that involves throwing metal balls at each other. For whatever reason, only men play it in Paris. Please note the coat wrack in the back on the left. Not quite as manly as the unofficial Argentine sport: pato. Sort of like polo, I gather, but played with a dead duck. Of course, in these modern days you couldn't just run around with any old dead duck (consider avian flu!) so they use a regulation-size fake duck I believe.